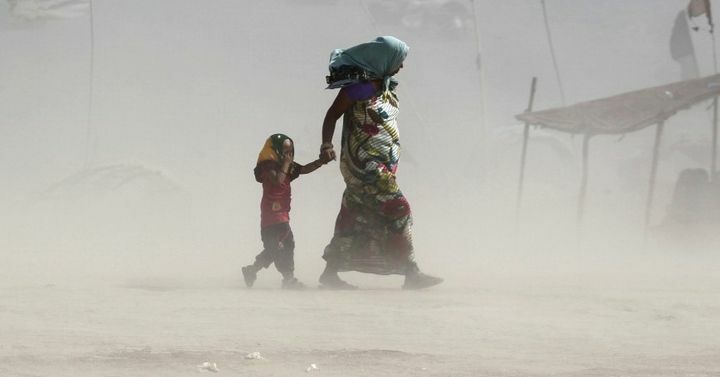 A mother and her child walk along the Ganges river during a dust storm on a hot summer day in Allahabad, India, June 9, 2015. Heat waves across the world have killed tens of thousands of people since the turn of the century. In the U.S., more people die from deaths related to heat than all other natural phenomena combined. Parts of West Asia are expected to become inhospitable to human life by the end of this century. And in recent years, India and neighboring regions have experienced several devastating heat waves, causing the country to increasingly focus on a growing global concern—rising temperatures as a public health threat. By 2022 India’s population is projected to exceed China’s, making it home to one-fifth of the world’s population. As a developing country located in the tropics, India suffers from factors that make it vulnerable to heat waves: persistent poverty, poor sanitation, a precarious water and electricity supply and low rate of access to health care. Lives can be saved by simple prevention measures that include educating people how to cope and having an organized response plan. Such measures can also be extremely cost effective. But in developing countries, resources are scarce. Therefore it would help if we knew which populations are at risk. To address this, researchers from the nonprofit RAND Corporation, supported by RAND’s Center for Asia Pacific Policy, developed a heat vulnerability index.